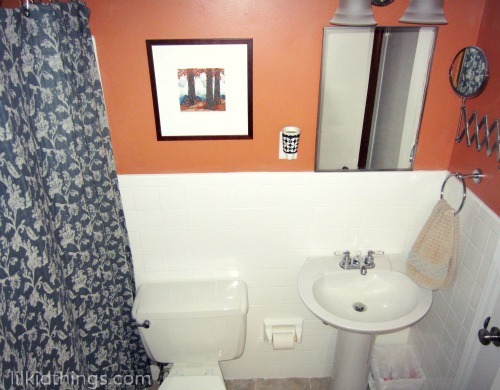 Thank you to Kleenex Hand Towels for sponsoring this post about how I’m making my bathroom guest-ready! To learn more about Kleenex Hand Towels or to find out how you can save money when you buy your own, check out this site. We have 1 and a half bathrooms in our home, which means we only have one shower. It’s no big deal on most days. But knew we we wanted to make sure the main bathroom was suitable for everyday use and also for any friends and family who might be visiting. We moved into our 50 year old home in 2010 and since then we made a few easy changes. 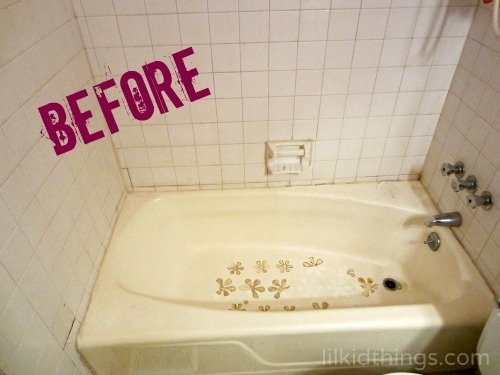 But I really didn’t feel we were guest ready until we had our tub resurfaced this year. The bathroom was in serious need of a makeover. 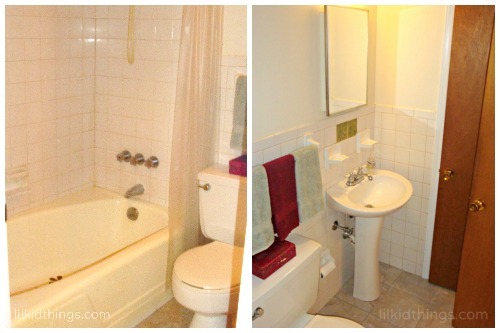 Old paint, outdated fixtures and a nasty bathtub were begging for some TLC. Thankfully, in time we have been able to get our bathroom guest ready! 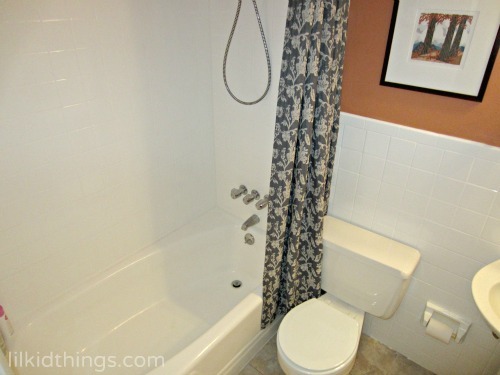 Most of the updates were inexpensive, however we decided with only one shower that it was important to splurge and get the tub and tiles resurfaced. And I have to say, it has made a huge impact on how comfortable I feel, not to mention how clean I feel. Paint! Always the first thing I put on my list, a good fresh coat of paint changes everything and it’s inexpensive. Score. Replace fixtures. It’s not hard to replace light fixtures, outlet covers and shower-heads. This is a DIY trick that really improves the whole feeling of the room. Even a bathroom. 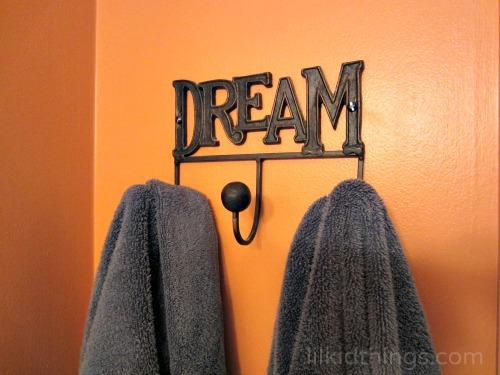 If you really want to go the distance, consider removing old built-in towel bars and soap dishes that don’t get used. We decided to take ours out when we resurfaced the tub and I love the new look! Make it personal. Bathrooms have feelings too! Ok, no they don’t but we sure spend a lot of time in there. It should feel like home. We added a print we purchased on our honeymoon and a few other little touches to our space. Get a new shower curtain and/or linens. There aren’t that many ways to change such a small space. 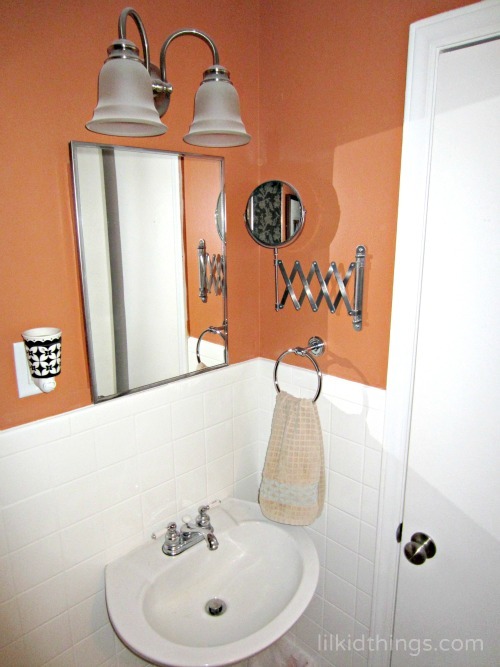 But between new paint and a new shower curtain, the difference can be dramatic. Sometimes just freshening up with a new bathmat will do the trick. When all else fails, resurface. Sometimes you really have to get your hands dirty to get things done. In our case, we paid someone else to get his hands dirty. Having a shiny white tub as opposed to the dingy yellow one that was chipping has made such a difference for me. I feel like I am finally ready to welcome some guests! Join the 14 million people who have already joined the Clean Hands campaign by using Kleenex Hand Towels and click here for savings and more! Avocado Deviled Eggs you must try! Such an improvement. Well done. Thanks so much! We definitely feel better having finished it.